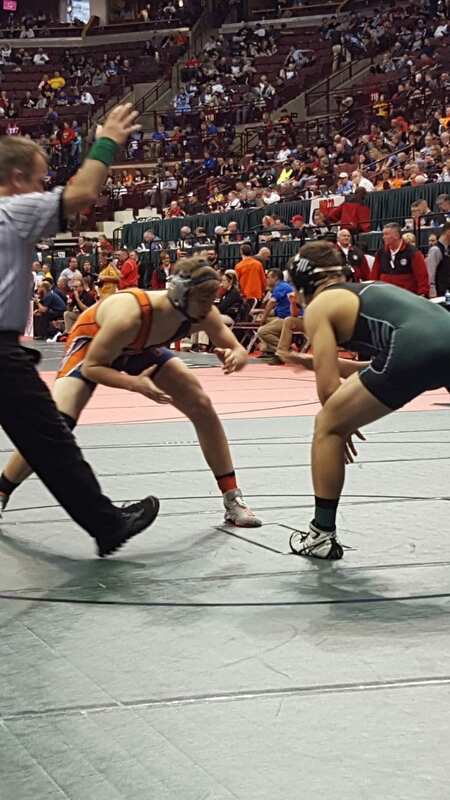 COLUMBUS —Four Northmor wrestlers and one from Galion remain alive on Day 2 of the state wrestling tourmanent. Galion’s Garrett Kuns and Northmor’s Conor and Conan Becker, Jake Neer and Matthew Ross will wrestle today in the hopes of securing a place on the medal podium Saturday. See more photos from Day 1 in our online gallery. Hundreds of wrestlers (672) from Division I-III took to The Jerome Schottenstein Center on the campus of The Ohio State University with one goal in mind, a coveted state title. With more than 10,000 fans looking on, this is how participants from Galion and Northmor fared. Kuns finished the first day of competition at 1-1 and is still in the hunt for a medal. He opened up against Logan Stanley of Apple Creek Waynedale and was defeated 7-6. In the first round of the consolation bracket, Kuns would advance to quarterfinal action on Friday by defeating Hunter Corbin of Johnstown Northridge by a 5-2 decision. At 120 pounds, Northmor’s Neer also is still alive despite an opening-round defeat. Neer fell to Evan Guilford of Defiance Ayersville in his first match by a 13-3 major decision. Neer would be pitted against Nichola Cianciola of Canton Central Catholic in the lower bracket. It took three periods, but Neer survived, winning 5-0. Three Northmor wrestlers won their first-round matches so had to take to the mat just once on Thursday. In the 138-pounds weight class, Conan Becker was victorious in his opening round match against Zane Strubler of Casstown Miami East. Becker is returning to state for a second straight year after finishing fifth overall in the 132-pound class in 2016. His second round opponent will be Ausin Eick of Rossford. Freshman Conor Becker wrestled his way to a second-round match on Friday as well. Conor defeated Jordan Cress West Milton Milton-Union, by a 6-0 decision. Conor will now face-off against Cody Rhoads of Orwell Grand Valley. Mathew Ross kept his senior season and hopes for a state title in the 152-pound weight class. Ross was matched up against Nathan Rasmussen of Orwell Grand Valley and won 8-5. He will now take on Jake Huston of Oak Harbor on today. Galion’ junior Mason Weldon’s first match of the day in the 285-pound weight class was against Seth Douglas of Troy Christian. Weldon was pinned in 5:08 to head to the consolation bracket, where he was pinned by Brayden Phillips of Massillon Tuslaw in 2:01. Aaron Kitts, wrestling at 132 for the Knights, squared off against Isaac Elliott of Massilon Tuslaw in his first match of the day. Elliott pinned Kitts in 1:47 to send Kitts to the consolation bracket. In that match-up, Kitts met Reilly Heater of Sherwood Fairview. Heater would take the contest by a 15-10 decision and end Kitts’ season. In the 182-pound weight class, Mason Burger of Northmor would meet up with Madison Jaso of Gibsonburg in the opening round. Jaso was victorious by pinfall in a time of 1:16. Tyler Ebbeskotte of Ottawa-Glandorf would be the first match for Burger in the opening round of the consolation bracket. Burger was defeated by a 7-2 decision and his career at Northmor was ended. Nathan Price, at 195-pounds for the Knights, faced off against Dylan Hinton of Bloomdale Elmwood in the opening round. Hinton needed just 1:00 to pin Price and send him to the lower bracket. In that bracket, Price would also see his Knights’ wrestling career end, as he was defeated by Wyatt Long of Sidney Lehman Catholic by technical fall, 17-2.